A limited edition yellow P Zero Velo. Years of top-level racing expertise deliver the crowning jewel. 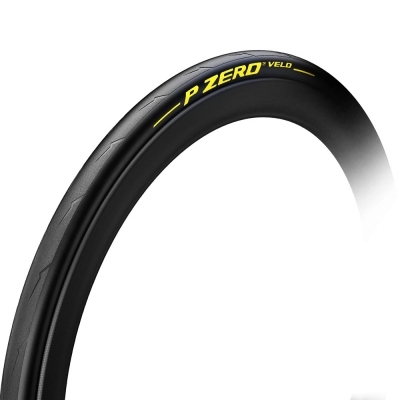 The P Zero Velo sets a new standard in bicycle clincher performance. At its core, the patented Pirelli Smartnet Silica® which provides superior grip in both dry and wet conditions, as well as unparalleled puncture resistance and mileage longevity. Really good tyres. They offer fast rolling, at least as fast as Continental GP4000SII. They are much easier to fit on my FULCRUM wheels vs the murderously tight Continentals. They are grippy in all conditions. They do cut up easily on rough roads though. I like these tyres. This is my second set. I opted for the red limited edition which looks really good. They come nicely boxed in a good sturdy box that can be used for storage when you remove the tyres, unlike the flimsy boxes provided by Continental. Stunning beauty! Just as good as any other racing tires I have tried (mostly conti 4000s2), it really stands out of the crowd with the yellow logo. Happy customer. Wow, how good looking are these tyres! But not just lookers they perform too. I've had mine on a week now, stunning performance and no punctures (even with lightweight race tubes). Not cheap but i'm enjoying riding them and you can't put a price on that.